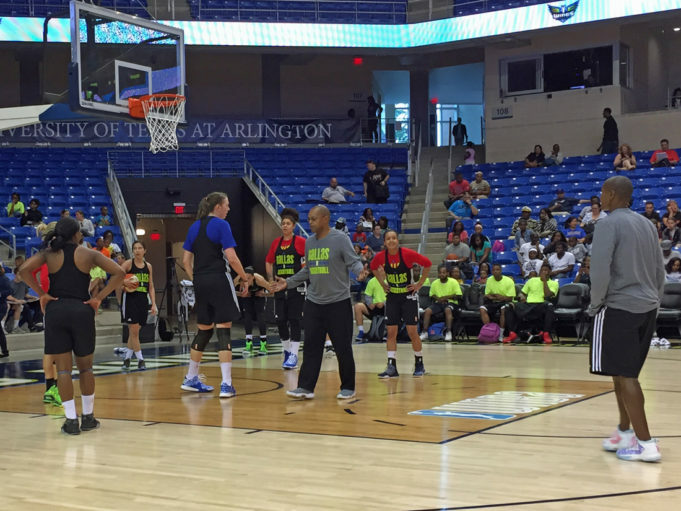 The WNBA’s Dallas Wings want you to know this is not your mother’s basketball game. “My style of play is to get a lot of shots up and run,” said Wings head coach Fred Williams. When I say “your mother’s basketball game,” I definitely mean your mother, not my mother. My mom once scored 57 points in a 1950s high school hoops game in Virginia. It was the old six-on-six version of the sport, but we can still surmise she got a lot of shots up and moved a good bit that day. So watching women’s hoopsters getting up and down the floor will be nothing new to her, but if you (or your mom) were expecting a plodding game from the area’s new women’s pro team, the Wings expect to show you differently. As he began training camp with Sunday’s open practice at UT-Arlington’s College Park Center, Williams mandated a number of full-court drills as he started implementing his preferred approach. Diggins will play her third season in Williams’ system in 2016, having been part of the team when it was based in Tulsa. She missed much of last year with a knee injury, including an opening-round playoff loss. With the former All-Star back, Williams expects his core to be a strong one. “We’ve been one of the top-scoring teams in the league the last couple of years with the same personnel,” he noted of a group that led the Western Conference in points-per-game in 2015. He also expects some off-season additions will improve his club’s ability to execute his preferred style of play. One of those shooters came to the team in March via a trade with the Los Angeles Sparks. “You’ve got to have a nice veteran player who has won championships in this league that can step in in the perimeter area and knock down some threes for you,” said Williams of new guard Erin Phillips. The Australian Olympian, who already had a house in McKinney, feels Williams’ preferred tempo will fit her game. Williams hopes his players aren’t the only ones who find his favored pace enjoyable. “I call it a fan-friendly atmosphere for the family. If (the players) do that (play up-tempo) and play well, these fans will come out and watch us,” the coach suggested. If you do, you’ll see some fast-breaking ball. In truth, if you thought modern women’s basketball was a slow game, you probably should have realized long ago those stereotypes weren’t accurate. Some folks have known since the 1950s. You can see for yourself when the Dallas Wings open their regular season home schedule May 21.